Europe is dealing with an unusual crisis which goes beyond Britain’s planned exit from the European Union and will not blow over in a few months or years, German President Frank-Walter Steinmeier said in joint press conference with Greek President Prokopis Pavlopoulos in Athens on Friday. The remaining 27 member-states should strive to keep Europe united as “what we considered self-evident may not be so self-evident,” he said. 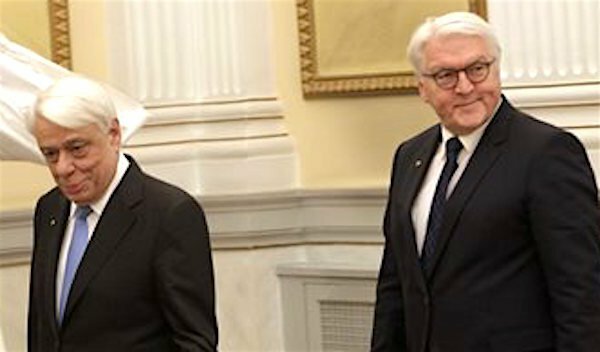 Steinmeier is on a two-day visit to the Greek capital to open the international contemporary art exhibition, documenta14, following an invitation by Pavlopoulos. One way of overcoming people’s indifference for politics is by finding answers to problems which have not been answered yet, he said, noting there is much more activity and discussion in the EU today than 2-3 years ago. “It’s important to provide real answers on questions that have not been answered yet. There are issues of domestic and external security. People are ready for consultations and we have to provide answers on migration, growth and employment,” he continued. “The limited consultations between us are no longer enough. We have to provide real solutions to problems and answers that our people so far haven’t heard from us,” he added.On the economic crisis, the German president said the completion of the review must not monopolize Greek-German relations adding he’s pleased with today’s news of a deal between the Greek government and its creditors. “I hope there will be a comprehensive conclusion of the review to end uncertainty,” he said. Following the press conference, Prime Minister Alexis Tsipras also received the German President at the Maximos Mansion in Athens, greeting him as a politician that is fighting for Europe’s unity and a good friend of Greece. He noted that art and culture were a bridge that could help unite the Greek and German people, overcoming the recent years’ disruption in Greek-German relations. Steinmeier, on his part, referred to a need to once again “start talking positively about Europe and not consider that Europe is responsible for everything,” especially in the wake of Brexit.